Last July, I reviewed PDF+, a PDF tool for trial lawyers from ExhibitView Solutions, a company that has developed several products for trial preparation and presentation. 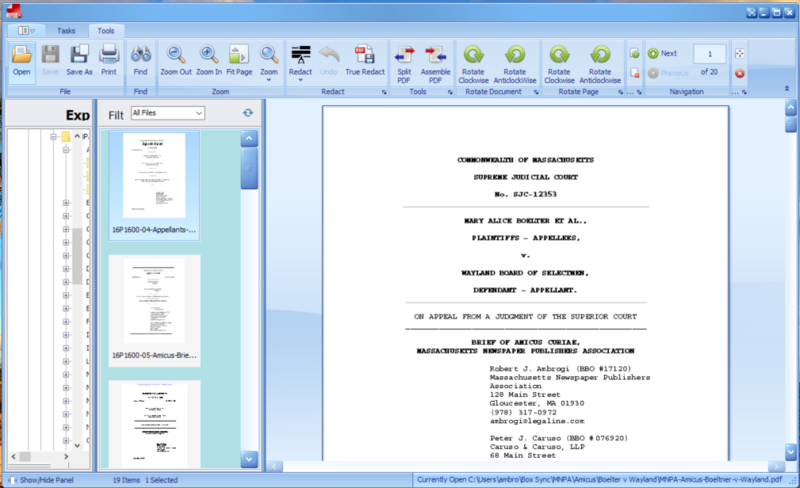 As I noted then, PDF+ is designed to be a more agile alternative to full-featured PDF programs such as Adobe Pro DC or Nuance Power PDF Advanced, providing just the essential functions that lawyers need to prepare PDFs as exhibits. A redaction feature that was not true redaction. No warning that certain functions cannot be undone. Inability to save original files during batch-rename process. Quirky “skins” to change the program’s appearance. In December, ExhibitView released a major update of PDF+, and I am happy to report that all four of my concerns have been addressed. Batch renaming. Rename all the files in a group and add sequence numbers and dates. Create exhibit stickers. Add exhibit stickers with custom text, fonts and colors. Add bar codes. Add bar codes to documents based on their file names. Bates stamping. Add Bates numbers with custom fonts and colors. Page controls. Insert, delete and rotate pages. In my prior review, I noted that PDF+ allowed redaction by drawing a rectangular block over the portion of text to be redacted. However, it was not true redaction. If you were working with a text-recognized PDF, the redaction covered the text but did not remove it. That meant that, if you copied the redacted text and pasted it elsewhere, the redacted text would be visible. The new version of PDF+ fixes that. It offers two separate functions, Redact and True Redact. Redact is the same as before, and is for use when you simply want to cover over text for visual presentation to a jury but do not need true redaction. The True Redact function creates a new, flattened document in image-only format in which the redacted text cannot be viewed. A second concern I raised in my original review was that several functions could not be undone, but there was no warning of this. For example, when I used the Delete Page function to remove a page from a multi-page document, it could not be undone and the page could not be restored. In the prior version, when batch renaming a set of files, the original files with the original names were lost. I suggested providing the option of creating new files with the new names while retaining the original files. The new version now includes this option. In my original review, I thought it odd that PDF+ offered the ability to change its appearance using a variety of “skins,” including several holiday-themed skins, such as for Halloween, Christmas and Valentine’s Day. The new version removes this option and has only the default skin. So if you were hoping for a Valentine’s Day theme for your PDF program next week, blame me. When I first reviewed PDF+, the price was $29 a year. That also has changed. It is now $89.99 a year for up to 10 users. When searching a document, matching terms are all highlighted at once, instead of one at a time. The number of tabs has been reduced to two — Tasks, with all functions related to working with multiple documents, and Tools, with all functions related to working on a single document. Toolbar can be toggled to show or not. Sticker designs can be saved for subsequent use. A release planned for March will add the ability to mark-up PDFs and add text annotations. ExhibitView offers a 30-day free trial of PDF+, so you can try it for yourself. The company will also be exhibiting at ABA TECHSHOW March 7-10 in Chicago. PDF+ is not a replacement for a full-featured PDF program. But for preparing PDFs to use as exhibits, it provides the essential functions you would need in an easy-to-use application and at an affordable price. And it says something about the company that, when I raised criticisms about its product, it responded by fixing them.